Somewhere in the world, the following two scenarios are currently being played out. Both reflect a passive, victim mentality. Both undermine the brand. Both open the door to competitors. Blaming the economy is a convenient excuse for not providing training and far too many organizations just don’t get it. The billions of dollars organizations spend each year on marketing and branding efforts are, for the most part, wasted. Why? Because the restaurants, stores and law firms awaiting those new customers attracted by the marketing campaign are all too often filled with indifferent employees. Yes, new clients and customers might appear, but far too many organizations chase them away with lousy service and lackadaisical employees. Cutting corners on employee training is a guaranteed path to brand banality. Do you have Kikubari in you? Last summer I had the honor of speaking at a conference attended by over 2,500 independent pharmacists. Just before I spoke, a married couple ─ both of whom were pharmacists ─ addressed the audience. They talked about how the pharmacy they owned had been completely destroyed during the tornado that devastated Joplin, Missouri on May 22. More important was their story of how the community came together during that tragedy; strangers helping strangers, people risking their lives to reach out to their neighbors, everyone pitching in. Within a week, this couple was able to throw together a makeshift pharmacy, in a temporary location. They then worked feverishly to provide vital prescription medications to their community. While choking back tears, they told the audience about the many people who had pitched in to help them rebuild their family business. They couldn’t have done it alone. Although they didn’t use the word, they were the beneficiaries of Kikubari. Ki means “energy,” or “power.” Kubari means “to distribute,” “pass out“ or, “to give.” Together, they mean exactly what that couple from Joplin, Missouri experienced when they, with the help of their community, rebuilt their business from a pile of rubble. This is Kikubari. The people of Japan live and breathe the concept of Kikubari every day. Why do you think there was no looting in the areas devastated by the earthquake and tsunami that recently jolted Japan? This is Kikubari. What do you do that equals Kikubari? Don’t wait for a disaster, start today. Sweat is pouring into my eyes, but I can’t wipe them. I’ve lost all sense of direction. I can barely see where I’m going, yet know I’m surrounded by people. Oh, yeah, there’s one more thing that scares the heck out of me, a fear that is all-consuming … I hope I don’t step on someone’s child. Finally, my “handler” guides me away from the crowds and through the door that leads the backstage dressing room. I’m exhausted. As I recover from my ordeal, I reflect on the last few hours and come to an amazing conclusion: Being Tigger isn’t exactly a walk in the park. This job wasn’t nearly as easy as I thought it would be. It took some convincing, though. I had to spend several hours encased in 20 pounds of bacterially-challenged fur. Better yet, I had to maintain my balance while supporting the massive helmet that covered my head. On top of that, I had to endure the endless pokes and prods from customers vying for my attention … pokes and prods that occasionally hit some sensitive areas … I guess they thought they were poking Tigger’s belly-button. I, along with several other employees, got to be “costumed characters” as part of a job-sharing program at Disneyland. In addition to the time we spent in those amazingly confining costumes, we also got to meet the professional actors who work as the characters, full-time. We heard about the hours and hours of training they receive to learn how to “become” the characters they are portraying. We listened to their many stories of unique customer interactions with a newfound sense of respect and compassion. We asked a lot of questions: How could they do this job during those blistering hot mid-summer days? How did they maintain their sense of humor while being jostled by thousands of customers on a daily basis? After being Tigger for a day, I had a newfound respect for those employees who, at first glance, seemed to have the easiest job in the world. After all, no one ever yells at Mickey Mouse when the weather is lousy or when a ride breaks down, right? We learned a lot. Job-sharing is a powerful tool for building strong teams. Hearing about or, better yet, doing the job of a colleague who is on a different shift, or who works in a different division, is a powerful leadership and customer service tool. At a minimum, job-sharing can reduce the barriers that often develop between employee groups−the infamous silos that can destroy collaboration and communication. It can minimize or eliminate the inevitable “grass is greener on the other side” petty jealousy traps that plague so many teams. In some work environments, job-sharing can be used as a cross-training tool. And, it can be as simple as a noontime brown-bag-lunch event where employees share the pros and cons of their jobs. You can make job-sharing as complicated or as simple as you want. The benefits are endless and I’ve never heard an excuse for not doing it that couldn’t be overcome … with a bit of creativity and flexibility. Flattys. This is how circus performers refer to their customers, the audience in the bleachers. The reason? Since the audience is sitting beyond the reach of the bright lights shining on the performers, they appear – at least to the performers – as a faceless, emotionless, one-dimensional blob of cardboard cutouts. Hence, the word flatty. Who would think of their customers as a faceless, emotionless blob of cardboard cutouts? No one in their right mind would openly admit to this, yet countless companies continue to act as if their customers, and employees, are nothing more than flattys … they don’t matter and are easily replaceable. Their opinions don’t matter, so no need to ask them about the quality of the show or how to improve, right? Here’s some sage advice I heard years ago from a colleague named Hal Burrows. “The flattys don’t come back.” In other words, treat people with indifference and they will be done with you. Hal was a time-management consultant I hired when I was in charge of training at the Disney University at Disney Studios. Hal helped create the award-winning “Managing Management Time” training program with Bill Oncken, better known as the “Who’s Got the Monkey?” time management seminar. Hal and I collaborated on a newer version of the time management seminar that we planned to call “The Monkey Meets the Mouse,” but that never flew with Disney leadership (that’s another story, altogether!). Hal eventually teamed up with Ken Blanchard to create the best-selling “The Monkey Meets the One-Minute Manager.” Hal was not one to take “no” for an answer. Greet people. Thank people. Say “hello.” Say “goodbye.” Say “thank you.” And do this with some direct eye-contact (yes, it means tearing your eyes away from your phone or computer for a few seconds). Since a growing number of customers and team members can also be in far-flung locations, it might mean sending a text, e-mail or letter expressing your appreciation. When was the last time you did this? Flattys don’t come back, but those who are appreciated and respected do. I once spent 90 minutes listening to someone describe, in excruciating detail, a concept that they’d already shown me 2 weeks earlier. Why did I do this? Because I didn’t want to be rude. Because we’d set aside 2 hours for the meeting anyway, so we might as well fill the time. Because we hadn’t confirmed the discussion points beforehand. Sound familiar? 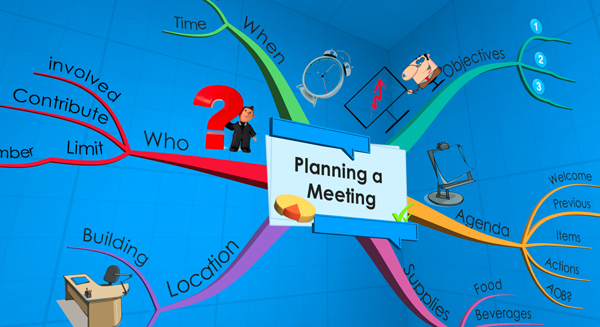 Make a map to plan your meeting, starting with the objectives. What do you need to get out of this meeting? What is the point? Outline an agenda that is specifically targeted at those objectives. Anything that isn’t relevant must either be scrapped or discussed at another time. If there is extra information on the meeting topic, you can put this in a document and attach it to your map for attendees to review before the meeting. Before is far better than during if you want more considered ideas or quality feedback. Next consider the ‘Who’. Who needs to be involved in this agenda? If someone is only on the list because they need to be kept in the loop, rather than to actually contribute, then cross their name off and send them the meeting minutes afterwards. The more people involved, the longer the meeting will run and the more tangents you will wander off on. Remember – there is no rule to say every person needs to be present for the whole meeting either. Think of it like a play; actors are only on stage when they have something to say or something to respond to. Otherwise, they would just be standing awkwardly, taking up space. Finally, address the details such as time, location, supplies etc. When complete you can send the map to all of the attendees before the meeting. If you are capturing the minutes from a meeting, you will usually find yourself furiously trying to scribble down everything that is said, missing huge chunks and not being able to contribute anything yourself. Using iMindMap on your laptop or tablet instead can save you a ton of time. To keep your notes clear, use a branch for every topic or person/department involved in the meeting. When anything is discussed that is relevant to that topic/person, you can add it onto that branch. This way you can maintain a coherent structure to your notes without having to squeeze extra points into the margin when the discussion suddenly backpeddles to an earlier topic. Sometimes an exact transcript may be required, but for the majority of meetings thekey points will suffice. Try to let go of the fear of missing something important – ironically this is far more likely to happen if you try to write down every word. Use key words wherever possible instead and make use of the Audio Notes feature to record sections of the conversation if you don’t want to have to worry about capturing it yourself. For every topic you should also have a separate branch for Action Points that will show what needs to be done to achieve the related objectives. You can also use Relationship arrows to show information that is connected or will impact on certain tasks. Don’t forget to include deadlines and the person/people responsible here as well. For a really powerful way to run a meeting, hook up to a big screen so the whole group can see the minutes map. This is a fantastic way of providing a live overview, as well as ensuring you have consensus from everyone involved on the points you’ve captured. How many meetings have you had where you’ve come out feeling inspired, motivated, ready for action…only for nothing to ever actually come of it? This is a trap many of us fall into. We get so carried away by the exciting ideas and the fact that we’re all agreeing with each other, that all we’re doing is patting each other on the back and further explaining why the idea we’ve had is such a good idea. What we fail to realise is that no one actually knows who is supposed to do what next to make this idea happen. Now if you’ve been using your map and an Action Point branch for every topic, you shouldn’t have this problem. It’s refreshingly simple – if you get to the end of the meeting and don’t have any action points on your map, then you aren’t finished! Using iMindMap means that it is instantly clear where the gaps are. After the meeting you can send your map out to all of the relevant parties and they will have a visual snapshot of what was covered and what they need to do next.